In response to the National Registers for Communication Professionals working with Deaf and deaf blind people (NRCPD) strategic plan for communication support professionals, registration and standards, Lesley Weatherson (lipspeaker and BSL interpreter) presented to the NRCPD board a new association in March 2017. It was debated by the board and the Chair concluded in summary that the association was welcomed and needed. Lesley is the former Chair, Vice-Chair, treasurer and committee member for the ALS ( The Association of Lipspeakers) and has over 15 years of committee experience including being the ladies representative at board level for her local rugby club and registrant member of the NRCPD board. There is a growing need to develop the lipspeaking membership association and a need to separate lipspeakers who can sign from those who can’t. This will make it easier for deaf people to find the support professional that best matches their needs. Of course lipspeakers who satisfy the criteria can be members of both associations. This makes it clearer and easier for deaf people who specifically need a lipspeaker who can use signs to support meaning. The ALS is now over twenty years old and well established. Indeed, Lesley was Chair from 2013-2016 and introduced internet banking, a new dynamic website, an established social media presence, 3 opportunities a year to obtain CPD points for learning and development and saved the association spending out precious funds on travelling by introducing committee meetings through Skype. She successfully completed her Chairmanship then sought new challenges. Never one for sitting on her laurels! The Association of Lipspeakers with Additional Sign (ALAS) was created as a response to the communication needs of deaf people. The new association is in response to the growing demand for communication support in English, with signs borrowed from the complex British Sign Language. Lesley explains, “There is a growing need for change; for development. Not because I say so, but because deaf people are relying more and more on a service that on paper doesn’t exist”. ‘Being deaf in a hearing world is challenging and potentially isolating. Innovation which improves the quality of the support we receive is welcome. When you are deaf you have no choice but to use any visual signals you can access to help you understand a situation. There are no rigid boundaries about ‘types’ of deafness – we all need to work hard to understand sound, whatever our preferences for communication. Many English sounds are ambiguous. We join beginnings and ends of words and lipreading without specialist support risks us completely missing important messages. In some cases – for example in health settings -this can be risky and dangerous and in others it can simply undermine us – which reinforces the isolation we can feel. I realised this many years ago when learning to lipread and trying to use my skills to develop my career. I encouraged any lipspeakers I used to add signs when they could, because it provided a crucial extra ‘safety net’ layer of meaning and reduced the risk of me misunderstanding.I have noticed colleagues who had previously used either BSL interpreters or lipspeakers sometimes opting for this type of support because it gave them more accurate understanding. But this type of support needs to be recognised and regulated. Sign supported lipspeaking is a type of communication support that some qualified lipspeakers are able to offer but are not trained or examined in. Lesley tutors trainee lipspeakers and she tells us that no previous experience of British Sign Language (BSL) is required in order to train as a lipspeaker. The A to Z alphabet, or fingerspelling, is used for initialising words that are difficult to lipread. Examples are pronouns or homophenes (words which look the same when spoken without voice). Think of mat, pat bat; without one’s voice they look identical), however no BSL signs are used to clarify or support the words. Sign supported lipspeaking is nothing new. It’s recognising in a more formal way a service that will hopefully give rise to a national occupational standard (NOS) and a future qualification to set a standard. This qualification will be based on vocabulary competence rather than on BSL linguistics and will be something to measure against to protect the user and registrant. Lesley was part of the creation of the NOS for the new lipspeaking qualification so feels well placed to take this forward to realisation. It’s about choice for the deaf person; having communication support that best suits the deaf person’s needs. The choice is already out there but to a greater or lesser standard. 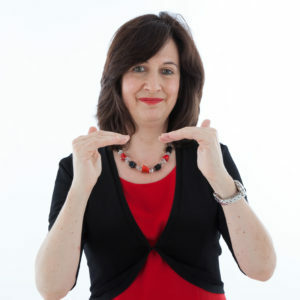 A lipspeaker with level one BSL would be hard pushed to say they can offer lipspeaking with sign support (unless the topic was dates, times and countries) but those who have completed level 2 and are working towards level 3 are capable of providing a service as their knowledge of BSL vocabulary is far better. Some deaf people, however, will require sign competence of level 6. This is easy to identify on the directory and each lipspeaker must declare their BSL skill level; some lipspeakers are also trainee and qualified BSL interpreters. Sign language interpreters are available for deaf people who prefer sign language. Interpreters can also work using Signed Supported English (SSE). This follows the grammar of English with signs to support each word. However, interpreters are not trained in lipspeaking skills and not all will be lipreadable. Lipspeakers are available for deaf people who lipread. Lipspeakers are trained in paring down the message to make the delivery lipreadable. Lipreaders can’t easily lipread a message that is spoken too quickly, without facial expression, without initialisation for confusing words or names. Many lipreaders now prefer to see signs added for meaning, for clarity and for understanding. Deaf people who like to lipread with signs to support the meaning can use lipspeakers who are able to use additional signs to support the meaning. This differs from SSE as interpreters aren’t trained in lipspeaking. A clear lip pattern is essential, hence lipspeaking with sign support comes under the remit of the lipspeaker. A new website has been developed which includes a directory for members to advertise their skills and contact details. Everyone registered in this directory is a qualified, NRCPD registered level 3 lipspeaker with a minimum skill competence of level 2 BSL. There is now one directory for lipspeakers who can offer this type of support in response to the need for change. Training will be available to those on the register to enhance the quality of support they offer. This will seek to promote best practice. Continuing Professional Development (CPD) is important for all communication professionals. With so few lipspeakers in the UK, and previously only one association for lipspeakers, CPD opportunities were difficult to find and focused on lipspeaking skills. ALAS will start by providing a minimum of 2 CPD opportunities annually for all members and these will include improving sign language vocabulary. The training will be open to deaf and hearing people. Please do check the website for details. If you are qualified in lipspeaking and hold a minimum level 2 BSL you can join as a full member. If you don’t have the minimum qualifications you can support the association by becoming an associate member. Student lipspeakers are also welcome to join. If you are interested in lipspeaker training please do get in touch.